ONIDA is one of the popular and well-known electronics brands in India. It comes under the company named MIRC Electronics Limited. It’s a consumer electronics company. The company was established in 1981 and it started with the assembling of televisions and later on, it transformed into the multi-product company and it started making consumer durables and appliances. Now they are ample of products under the brand name Onida and some of the key products are Televisions, Plasma TVs, LCD TVs, Washing machines, DVD and Home Theater Systems, Inverters, LED TV, LCD TV, Air Conditioners, Microwave Ovens, Presentation Products, LCD monitor and Mobile phones. You can also find the answer of all general searching of customer such as how to contact Onida / MIRC, what is the customer care number of Onida / MIRC, what is the customer care email id of Onida / MIRC, where is the head office of Onida / MIRC located, what is the office address of Onida / MIRC, Onida / MIRC head office contact details, Onida / MIRC customer care contact details etc. 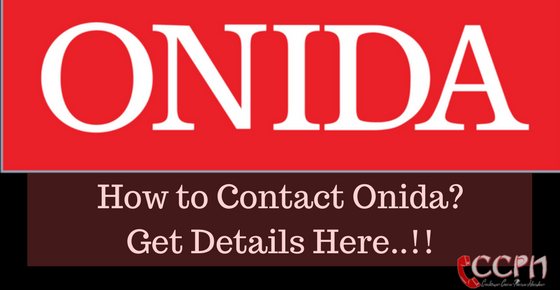 This was the brief introduction of ONIDA and its products and now we will move forward to provide you with all the available contact details of the company including customer care numbers, toll-free numbers, contact numbers, addresses, etc. These are the customer care helpline numbers provided by ONIDA/MIRC Electronics Limited for all the customers in India. If you need any support or need any help or have inquiries about product installation, warranty, etc. of consumer durable of the company then you call on these numbers. Note: If your state is not available on the above list then you call on the nearest state available on the list. The number starting from 1800 are the toll-free helpline numbers. You will not get charged for calling on these numbers. Now we are providing the contact details of the corporate office and the head office of ONIDA/MIRC Electronics Limited including full address, telephone number, mail addresses and the official website of the company. Head Office Address: MIRC Electronics Ltd., Onida House, G-1, M.I.D.C, Mahakali Caves Road, Andheri (E), Mumbai – 400093. This is the official website link of the company, copy this URL from here and paste it into a new tab to visit their official website. Follow these official social profiles to stay connected with the company. This link is for messaging company for different purposes. Follow this link to get the list of their dealers located in different cities and states. What is the Office Phone Number of Onida / MIRC? How to contact Onida / MIRC Office (Other Ways)? Head Office Address MIRC Electronics Ltd., Onida House, G-1, M.I.D.C, Mahakali Caves Road, Andheri (E), Mumbai – 400093. Reg: Onida AC not working and no response from the Service centres. We bought 3 Onida ACs on 31/07/2017 and one of the Unit (AC) S.NO: N#17DG3#013696 has not been working from the day of installation (Issue: No cooling at all). We made a complaint on 06.09.2017 and they told it is because of gas leakage (New AC- why should I get a complain of GAS leakage?) and they took more than a month time to visit back for the same issue. The next 2 days again the same problem arisen (No cooling at all) and still have the same issue. No response from Onida service centre and they are just disconnecting or avoiding our call. For your information, The AC was bought just 2.5 months back and we still never used it at all. Kindly take an immediate action to fix the issue once for all. I have also registered in https://www.consumercomplaints.in for remedy. Kindly let me know the right point of contact if you are not the right person. Attached are the details of Invoice copy (Purchase bill & Service bill) for your perusal. I have Micro oven with convention. Now, its door is damaged. It requires replacement. This is for your kind information that i have purchased a smart LED TV model no VMO4656 – ONIDA at 19 -09-16. There have come made big fault in this TV. As per instruction of service Engineer after checking the TV ,the motherboard is faulted. I have registered the complaint at 08-09-2017, complaint no _ 102136380030 and 1709136380030. There have no response from your side to till date. It is too bad that after many effort from my side your company is not taking any action. Now i am very serious in this case and i should be take a action against your company with the help of consumer court. This is N. Najafi, commercial manager of SHAHAB TV factory in IRAN. SHAHAB TV Co. with more than 60 years of experience manufacturing LED TVs in its fully equipped production lines , had joint to Hitachi , Sony , TCL , before , but now looking for another joint in LED TV business. You may refer to our web site as : http://www.shahabco.ir for more info about our company . Anyway, We are interested in doing cooperation with your esteemed company to assemble your LED TVs under your licence for Iran Market . May I ask you check the case & if OK , let me be informed ? I have send two mail about your product mobile. I’m also written complaint to more. No response. Onida service bad 21 days achi nhi h.
01139889000 or no response app Onida services achi bhi ha.sale man gunde lgta ha.9268686887. 9268686887 sale man gunda lgta hayou service very bad Onida. I bought Onida A.C. (INV12RGO) 15Apr2016. Since day 1 I have noticed E1 error in the A.C… I asked the installer about this and he said something is loose and he would fix. I started using it and did the same for 10 days. And then it was not used until Mar2017. It showed E1 as soon as I switched it on. Onida guy came and said some wire related issue but to my surprise they didn’t change the wire. Somehow they fixed that error. After 4 month once again I switched it on few days back and got the same error. Now this time Onida guy is saying that the mother board is burnt. I have bought inverter A.C… how could this happen..And at the last time when they knew the problem is due to wire then why didn’t they change it. Now I want help from Onida and request to replace this machine with a new one. Or at least fix the problem. Few years back I have bought Onida black beauty microwave model no/Serial no MO23CJS11B/MO23CJS11B11H04932 of which nw th display plate is not working. Then I have contacted onida service centre and placed a for display plate for 3800/- rs. But to my wonder after calling and mailing again and again the response was horrible. So nw I have register an complaint in consumer forum containing docket no. 222229. If still proper action and services will not provide to me then I have to go through consumer act as per the consumer forum. Few years back I have bought Onida black beauty microwave of which nw th display plate is not working. Then I have contacted onida service centre and placed a for display plate for 3800/- rs. But to my wonder after calling and mailing again and again the response was horrible. So nw I have register an complaint in consumer forum containing docket no. 222229. If still proper action and services will not provide to me then I have to go through consumer act as per the consumer forum. I am frustrated and annoyed with the false commitments from the engineers, service center employee (Nave en) and there manager those number is 9350982390. I have purchased this LED tv for 40,000 in 2016 January, but from 2016 July I am been calling to the customer care for my complaint of remote.Remove was replaced but engineer from onida opened the TV and changed some back panel buttons. From then I am facing a massive issue in TV. Sometimes TV display goes off and audio is there and there is no issue with the AV terminal. I requested for replacement and there is no resolution to my solution. Manager Said every think will be resolve till 10th January 2017 but now no one is ready replace this LED TV. I call manager on 9350982390 he always says I am in hospital I cannot help you. Although he is not providing any backup person number who can assist me with. DO not buy any product for onida. My sister purchased a black Onida 51600 from Top star mobile store ,Near co operative bank , kurathykad , Mavellikara,Allepy dist ,kerala on 3/11/2016 .Bill no: 315.The product is defective. The dealer refuses to change the set or repair it even though it is in warranty . My sister is a patient on constant medical care and aged father is a handicap with only one hand. Iam presently working in gujarat.This type of misbehavior does’nt do good for a well known reputed company like yours. Kindly guide your dealer to replace the set or I may be forced to take legal recourse. Hope you will do the needful and be helpful to an aged handicapped father. We are having the trained candidates under Electronics AC Technician & Home appliances sectors. so, we want to tie up with your company please provide the details of Regional service manager number of Hyderabad. I have purchsed led tv onida leo32hain android version.the retailer says that this led is full hd and rom is 4 gb.but i have found its not full hd and rom is only 1 gb ram.i clere my doubt in retaler shop.the retailer not inforrmation give me and call to agent mr. Balram.he coneect my call mr pankaj from karnal onida care.he says that its led is only hd and rom is 4gb with software.i have doubt 2.5 gb covered in software.and 1gb internal storage and 512 mb only sd storage. He give me suggested u can purched leo40ky thunder.its tv is 1080 picel resolution full hd and app,internal storge or sd storage same.so I m not comfortable for this led.i want to only one time purchesed led and relax for life time.so i decied and order is onida leo40 ky thunder.after 4 days this led is coming and installed my home we checked this led.and shocked this led only hd.and support 720 picel or rom is 4gb.internal storage 2.5gb sd storge 1gb.and all app is installed.so irequested plz solve my problem and give demo in my home or satisfied me.i hope u trouble shoot my problem. I buy Onida Ac , but a problem is come in it fan . i complained in service center but there service is very wrost. they resistered my complain (1610F8963888) on 2nd october but still this time there engg is not come for check. i call them many time but they still not come… very very worst service. no responce from there side. Services for the washing machine is very bad. From one month, we are back of service team. They give the reason that the spares have to come from head office I.e. Mumbai. Exactly from 1 month the services team delays and not responding the customers properly and politely. They are not ready to give the phone number or email ID of the senior managers. I spoke to the services manager Bangalore, Chandramouli. He says still it takes 8 to 10 days time. This is the way of their services. I have purchased ONIDA LED LEO40FAIN Model 6 months back. I requested dealer for Instruction Manual book and same informed installation service engineer, but no body response our request.. I hope this leave a comment space is for customer requirement fulling, please arrange to send me a PDF fiel for INSTRUCTION MANUAL for the above model. Thanks and expecting your help for our need. Sir I have lost my remote control of dvd player model DFX-5410.How and wherI can buy it from again. I buyed Onida Smart tv around 8 months before. now display/screen is getting shade in block color. i have complained and raised ticket more than a month, but still no support getting from Service team to fix the issue. Water leakage problem from Ac. I complained in customer care service they attend my complain after one week.They attend the complaint and the technician told me this problem arise because of dust problem. After two weeks the same problem started. This was second time I registered my complaint to customer care service they came and gave the same reason .For one month the Ac had no problem. At the month of april the same problem started I called again customer care service the technicians came they checked and told that they have to remove total unit to know what is the exact problem,at first i didn’t allow to remove the unit because , sir i purchased new Ac so how it can be posibble to have problem in that . I request them to replace Ac but they refused my request.Again i complained to customer care service this was my fourth time complain at this time i allow them to open the Ac .They checked and told me that the Ac coil has water leakage problem they said that this is manufacturing defect this statement said by onida co- ordinator maharajan and he assure me to replace the Ac. After three days there is no reply from onida cc incharge . now the another problem started from two three days the burning smell is coming from inside the Ac now a days i am not using Ac Because my family members all are scared .so sir this is big issue so i talked to onida whole madurai incharge Mr, shankar about this problem, i think this very small matter for him he is not responding correctly again and again he sending his technicians only for repair. Now you tell me sir if any thing happpen to my family because of burning or any other short circuit problem who is responsible for that.if i accept to repair the unit in future every time i have use this with scaring sence so this is my humble request to you to please understand my problem.And i hope you personally consider and take seviour action on my report and request. ater leakage problem from Ac. I complained in customer care service they attend my complain after one week.They attend the complaint and the technician told me this problem arise because of dust problem. After two weeks the same problem started. This was second time I registered my complaint to customer care service they came and gave the same reason .For one month the Ac had no problem. At the month of april the same problem started I called again customer care service the technicians came they checked and told that they have to remove total unit to know what is the exact problem,at first i didn’t allow to remove the unit because , sir i purchased new Ac so how it can be posibble to have problem in that . I request them to replace Ac but they refused my request.Again i complained to customer care service this was my fourth time complain at this time i allow them to open the Ac .They checked and told me that the Ac coil has water leakage problem they said that this is manufacturing defect this statement said by onida co- ordinator maharajan and he assure me to replace the Ac. After three days there is no reply from onida cc incharge . My recent complaints vide 1607D376380120&1607D376380121 dated 15/7/2016 are still pending. Your Tamil Nadu Manager and Onida Engineer are never responding. My brand new 1 ton split A/Cs 2 numbers purchased in March 16 are sweating in the indoor unit for which I registered the complaints. Very poor response and service. My mails sent to Onida customer service are also not responded. The fault might be manufacturing defect. So replace the units immediately. If not solved, I may be forced to go to Consumer Court. Bakwaas service never purchase if they gave a free. The control panel of my Splendor Xcel 6.2 fully automatic washing machine is dead and not functioning. I want a new panel. What is the cost of this? Instruct your service center at Thrissur, Kerala to attend to my this complaint, immediately. It very unfortunate to note that there is no proper and speedy redressal of the complaints from the service center. I had purchased one Onida spenor XCEl 6.2 fully automatic washing machine on 23rd December,2013 from M/s Nandilath G.Mart, Trichur, Kerala.Since that the first complaint developed on 26th may, 2016.After a very hard effort to locate your service center in Kerala and in-spite of my repeated requests A mechanic from M/s Adonis elecrtonics(Ernakulam/ Thrissur)attended to the complaint which was identified as in let valve filter block, and rectified. after that the control pannel of the mcahine gone dead and I am finding difficult to get it repaired by these people. Hence I would request you to: (1) Pl. engage responsible persons as service agents (2)Ask them to get my complaint rectified immediately (3)Let me know the cost of the control pannel. I have purchased, a washing machine from M/S Prithavi Electronic,Bhilai,C.G. Since starting(Feb,2014) water leakages problems observed from spinning tub .Many time service engineer(Mr Kamal)has attended the problem but they could not repaired the same.Because this manufacturing defect.Since beginning Mr. Kamal and M/S Prathavi electronic are making fool . Now I want to replace the same machine on urgent basis.as this is still under warranty.Now Shop keeper and service Engineer are asking go to consumer forum.So please take matter at your end before going to the consumer forum. I have Onida HTS1000U 90W 5.1 DVD Home Theatre. I need remote for same. I have complained time and again about my a/c Seed cool not working properly. I even complained to the service in charge Mr Shrikant here in Goa who only makes assurances he does not keep as he sends the boys to other sites. It’s more than half a month but no solution as there is only one technician I am told for entire Goa. I have installed more than 8 Onida A/c 1.5 and above at my premises, and have to now re think of it’s after sales service being horrible. Can you please get my problem fixed. Your help line too is always coming busy. 633, Pamela Mansion, Alto Porvorim, Bardez Goa- 403521, Mb 9923347909. 47/1C, Hazra Road, Kolkata – 700 019. Re:	Inferior quality of 1.5 ton window Air Conditioner and/or workmanship and/or spares provided by your company and/or your service centre “Adonis Electronics Pvt. Ltd.” of the then 70, Beckbagan Row, Kolkata-700 017 pursuant to complaint No. 13081606380500 dt. Aug. 4, 2013. 1. In or about 2008, we had purchased 1.5 ton Air Conditioner from your dealer “Sales Emporium” through Abhishek Jain. 2. Machine was perfectly well till 2012-13, then, in August 2013, upon complaint No.13081606380500 dt. 4/8/13, your service centre at Kolkata being “Adonis Electronics Pvt. Ltd. of 70, Beckbagan Row, Kolkata-700017 attended our office at 9, Old Post Office St., Kolkata-700001. Their Mohan Mistry did the requisite “Wet Service’ and changed the spares being PCB and Fan Capacitor and charged Rs.350 + 1550 + 275 aggregating to Rs.2,175 /-. After changing the PCB, our Mr. More complained Mohan Mistry of formation of three lines of ice on pair of pipes of cooling coil as also lesser fan air pressure, to which, Mohan Mistry observed that it would subside with passage of time. Mr. More also complained Mohan Mistry of a sound being heard after the machine was switched off by remote, to which, Mohan Mistry observed that it would also subside with passage of time. 3. This time, since cash memo/invoice No.13011685 of Adonis dt. 5/8/13 for job No.81-0800 by Mohan Mistry, Technician of Adonis inter-alia for changing PCB, colling stopped, and, complaint No.13081606382793 dt. 22/5/15 was made after 20 months of which 8 months (4 months of 2013 & 4 months of 2014) were of winter. Therefore, within 12 months, this time again, the new technician of Adonis visited and said that as ice formation on cooling coil caused damage to PCB and PCB has to be changed and might also fan capacitor afresh as Mohan Mistry or such other technician in 2013 should have done the requisite gas leak stoppage which has to be done now. 4. In fact, air conditioner, has been taken away by your service centre through Haradhan Ghosh (Mobile No. 97488 52044) for repairing at L76, Mughal Bagan Rail Quarter, Kolkata-700 076 viz. pressure testing, gas leaking removal, gas charging and repair/change of PCB. 5. We humbly submit that there is deficiency of service either in supply of inferior PCB or inferior workmanship, otherwise, PCB should not get damaged after one year of working. 6. Kindly investigate our complaint hereby and please ensure excellent service as we enjoyed from 2008 to 2013 from your window type Air Conditioner inter-alia by proper repair/service of Air Conditioner presently lying with your service centre “Adonis Electronics Pvt. Ltd.” , as aforesaid. We should not be made penalized for deficiency/inferior quality of service or spares or workmanship. Why Marc electronics discontinued Igo TV built in stb?it could have continued to manufacture led tvs with same features.Purly for free to air channels in any place on the earth. Very good information. I could not locate these on their new website. Thank you for sharing it here. I experiance With ONIDA TV is very Bad. I purchase ONIDA LEO32 HMS(LED) and feel that soud of this product is not clear. I complain. But not get any solution. remote of this product also become defective. I deposite Rs 500 for new remote to its authorised service centre ADONIS Electronics ,Sitapur Road, Lucknow on 21/02/2015. Until I not get remote. My expriance with ONIDA IS VERY BAD. I HAVE WON ON ONIDA TV.AFTER 4MONTH TV NOT WORK. COMPLAIN IN ONIDA SERVICE CENTER AND TOLL FREE NO. YES ENGG. COME BUT TV CONDITION IS SAME IN TILL DATE. Just ask me why purchase ur any other product.if this is ur probleum than you purchase onida product..